Another great section from the ABC des Schneiderhandwerk - this time from the Sakko construction. 1 - Vorpass - I have rendered as Core, ie the inner core of the buttonhole knots. 2 - Quispel - DZ has been a great reference for this term (see the cutter and Tailor forum), he says it was a cheaper version of gimp, a double twist of buttonhole thread. In this article Quispel seems to be a propriety term for a product in between double twist and gimp. 3 - Loops - probably 'knots' would be a more accurate term, but I have used the more literal version. Quispel/Vorpass, there is no translation. It is like the gimp but cheaper. Many tailors consider a cleanly worked buttonhole as proof of the prowess of a colleague. This will not always be the case, since a good buttonhole testifies merely to a skilful dexterity and flair. As an apprentice it is in any case incomprehensible how a rough man's hand can cleanly work a buttonhole barely 2 cm in length with such fine needles. Well — no Master has yet descended from Heaven — only practice makes the Master. Although each of us has already worked on buttonholes, the production of the buttonhole should be shown once more in pictures. The buttonhole has been cut at the intended place. Abbildung 217. 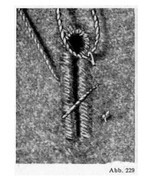 The edge of the buttonhole is secured from fraying by overcasting (blanket) loops. Thus, we take a fine needle and a finer silk machine-thread. It has proven to be advantageous to use overcasting (blanket) stitches when edging the buttonhole. Possibly, the fraying threads are drawn to the middle of the cloth layers, while the loose threads are lifted up by simple overcast stitching and thereby easily interfering with the looping out of the buttonhole. Abbildung 218. As a preliminary step, we take either, Gimp, (for hard buttonholes) or a doubled buttonhole silk (for soft buttonholes). We have chosen Gimp, to give a better distinction to the buttonhole silk. The preliminary step (A) is firmly anchored in the cloth and appears exactly at the beginning of the buttonhole in the upper surface of the fabric. There we also begin with the first loop of the buttonhole silk (B). Abbildung 219. The first loop is open. The needle is passed through this loop. Abbildung 220, and the hanging thread loops around the knot [bight]. Abbildung 221. we pull the thread/loop to. Abbildung 222. At the same time we cast the resulting knot over to the left. The first loop is therefore finished. Abbildung 223. Thus we lay loop on loop, careful of the tight and even position of the core and come up to the awl rounding of the buttonhole. Abbildung 224. There must be special attention to the core [Vorpass], that it not be torn from the edge, taking the loops. Stretching of the buttonhole can be corrected by tightening the gimp. Abbildung 226. now we catch the first and last loops together with the buttonhole silk and pull the thread through to the underside, where we stitch the silk and the gimp well. A thick overlying bar is worked by only few tailors, so we can dispense with a rough lock. Abbildung 228, and thus, bring the two rows of loops closely together. Abbildung 229. Before rounding with the awl, we also flip the thread around the outside. Abbildung 230. We tighten the basting thread, or buttonhole silk remainder, about twice before rounding with an awl, thereby with the straight lines of the loops are not pushed apart. Abbildung 231. Then we sew two stitches behind and so the buttonhole holds a good shape. Here is the completed buttonhole seen from the back. As far as the normal buttonhole, it's production is probably best known. But we don't want to overlook an ornamental buttonhole, often used in the past: the Gimp buttonhole. Today, it is only worked onto silk lapels, thus Dress jackets, Smoking jackets. On the other hand it has formerly been used for suit-coats. As a core [Vorpaß] one takes tube or wire gimp, (hence the name: "gimp buttonhole"), this is a core of cotton fibres, tightly wound with silk. A fine gimpen silk is used for the loops. This has about the strength of a fine silk hand sewing thread. In contrast to the normal buttonholes, the loops lie not on the core but next to the buttonhole incision. Abbildung 232. The 'Blind' buttonhole. Since it should look exactly like a cut buttonhole, it is also made in the same way (A). The buttonhole silk is visible at B.
Abbildung 233. The laid loops are done just like normal buttonholes. Abbildung 234. The finished 'blind' buttonhole. Both these buttonholes were processed with overlying bars. The threads of buttonhole silk were locked twice before the first and last loops were laid. When the Buttonhole Silk is Broken. It sometimes happens, that when knotting up a button hole, the thread breaks. This is very vexing, since one must now introduce a new thread that yet gives a good transition. In such cases, we help ourselves in the following way: The last loops are opened, until the remaining thread end is about 4 cm long. The last loop remains open, and now we guide the needle closely next to the last stitch, and bring the new thread as usual, through the last loop. We pull the short end of the thread and close the loop. By pulling the new thread through, the loop lies in the correct position. The button hole can then be finished as usual, the short end is simultaneously sewn into the new stitches. This way is simple and yet safe. Abbildung 235 shows the buttonhole with the torn thread. Abbildung 236 shows the introduction of the needle from below, to the same place at which the last stitch came out above. The last loop is pulled up. Then, after the needle is inserted, we pull the new stitch up, til the knotted thread end. Then we pass the needle from behind through the loop and pull through the remainder of the old thread. Abbildung 237. The tightening of the last loop, with which the new thread is simultaneously brought to the correct place. The button hole is finished in the usual way.